Shaving brushes are used to apply either shaving soap or cream to your face when shaving. Searching Amazon for a shaving brush and browsing through the images will quickly reveal the vast variety of styles available. From functional to pieces of art, there is an overwhelming number of choices to compare. That’s why we asked several barbers and clean shaven guys to tells us about the best shaving brush they’ve ever used. If you have experience with any of these brushes, please leave a review or vote for your favorite below. Shaving brushes come in either a lightbulb shape or a dome. Brushes in the shape of lightbulb are either knotted or trimmed to achieve the shape. These types of brushes usually have shorter hair on the outside and longer on the inside, giving the brush a compact feel. A brush with this feature provides the shaver with control, allowing you to apply the lather exactly where you need it. When using this type of shaving brush, the method is more back and forth, like when you’re painting. A dome shaped/fan-shaped shaving brush, on the other hand, has flatter bristles. These types of brushes feel fuller due to the larger surface area. The longer bristles of these brushes hold more water, and can create a richer lather. The longer hairs also hold more water, keeping the lather hydrated the whole time. Due to the larger surface area, this type of brush is messier to apply, and is applied in circular motions. Choosing which one is best for you will ultimately depend on your person preferences. The Parker Safety Razor Handmade Deluxe features long loft bristles, making it easy to work up a lather in a mug or cup. Why use a shaving brush when you can just use shaving cream out of a bottle? A shaving brush infuses your shaving cream/soap with water, create a much richer lather. The bristles also work to gently exfoliate your skin and lift away dead skin cells for soft, healthy skin. By exfoliating the dead skin off your face prior to shaving, you reduce the amount of dead skin that can clog your razor and can help minimize acne breakouts. 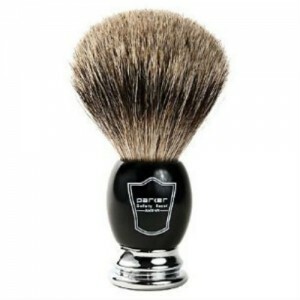 Another benefit is that a shaving brush helps to lift and soften your hair, allowing you to get an even closer shave. Many experts agree that using a shaving brush is one of the biggest factors in achieving a close shave. Badger hair, a common bristle material, is frequently used due to is water-absorbing properties. The bristles absorb hot water and infuse it into your soap or cream as you work up the lather. Cheaper shaving brushes use boar hair or synthetic bristles instead. Shaving brushes also come with different grades of badger hair bristles. If you are new to wet shaving, there is no need to get an expensive premium quality shaving brush. In fact, it is best if you don’t. Premium quality badger hair is more delicate, and you can damage the bristles by applying too much force. The Parker Safety Razor Handmade Deluxe (check price) is the perfect shaving brush for both the beginner and experienced user. It is very affordable and features 100% badger hair bristles.